The Fiat Panda has become something of a classic: cheeky, fun and cheap, and it became a popular choice for first-time buyers. They’re sturdy, reliable and affordable, and after the success of their edition, Fiat chose to capitalise on this reputation by relaunching in 2004, whereupon the new Fiat Panda promptly won a European Car of the Year award. What it lacks in size, a used Fiat Panda makes up for in character and performance. It’s a small city car that looks good and doesn’t cost a fortune to run. The Fiat Panda's high body style shows a clear nod to mini-MPV principles, but its design in general is fairly conservative. It boasts a fairly boxy shape, though newer models do have smoother more elegant lines. It has a very practical five doors with a sensible layout, basic fascia and dashboard-mounted gearstick. All models boast at least two airbags, going up to six in others. ABS and Electronic Brakeforce Distribution became standard in late 2005. Designed as a city car, used Fiat Pandas aren’t built with large engines or inspiring amounts of power, but that’s to be expected with a car of this size. While the 1.1-litre used Fiat Panda is adequate, it is slower and noisier than the 1.2, which isn’t that much more expensive. There’s also the 1.3 Multijet diesel, which offers 70bhp and excellent fuel economy. The 4x4 is also good fun, even if you don't plan to go off-roading. The small engines mean that running costs are kept to a minimum, which is great because the Panda is usually associated with economy and affordability. The Panda's clutch and gear change deserve high praise, making acceleration nice and easy, while the useful 'City' button gives an ultra-light steering system for three-point turns and city parking. It's a cracking little car. 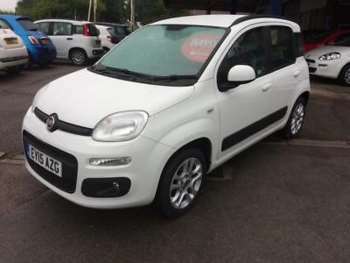 Got a specific Fiat Panda model in mind?